Sort of the opposite of “got me at hello” huh? Napping yet? No guilt, that was how I felt when I got to the temperance section of the book I am writing about Rev. John McNair. 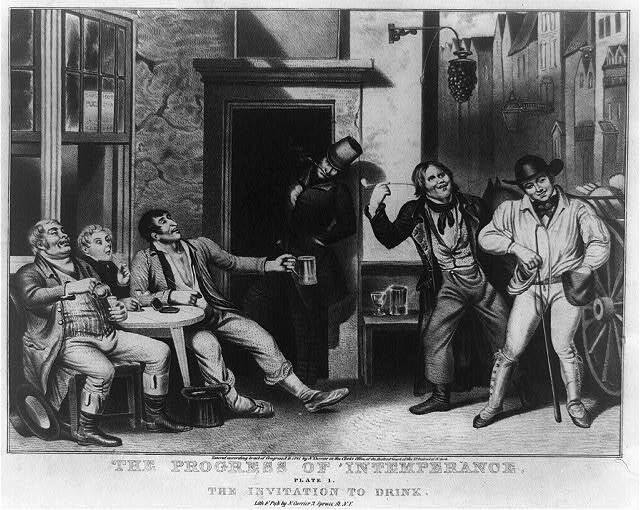 But without a doubt, the social habits that caused the temperance movement and the movement itself would have had an effect on your ancestors in some way. Did you know that in the 1820’s people drank three times the amount of alcohol today? There were a variety of historical reasons, but the primary cause was that beer, wine, cider and hard alcohol were safer and/or cheaper to drink than water, milk, tea and coffee. People developed habits and customs around drinking. Workers were served alcohol at their breaks by their employers. They literally drank from the time they woke up to the time they went to bed. In many of the books, I read it was commonly thought that America in the early 1800’s was “a nation of drunks.” Social reformers and religious leaders recognized the problem and started the American Temperance Society in 1826. 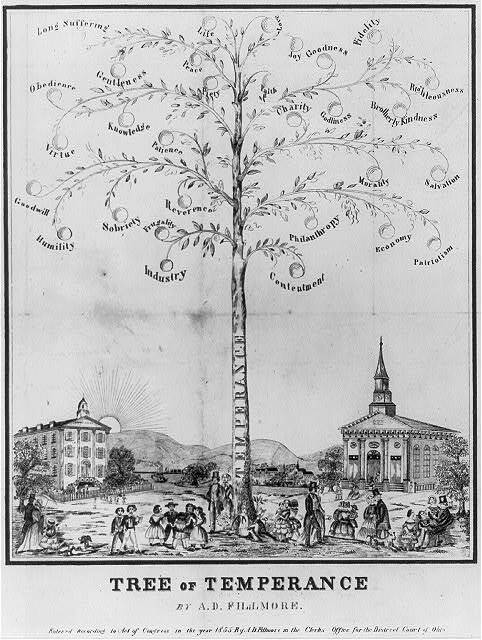 By 1835 1.5 million people had joined chapters in nearly every town across America. There were many who proposed total abstinence from alcohol and wanted to pass laws to prohibit production. Maine was the first state to pass a law to prohibit liquor production in 1851, with 14 other states following with some version of the legislation. However, there were many who objected to any type of legislation that would impinge on the rights of Americans including the right to drink alcohol. They believed moderation in drinking was the answer, not regulation. This is how I first discovered how deeply involved my ancestor Rev. John McNair was in the temperance movement. He had a debate about the Maine Liquor Law with an anti-legislation activist G. J. Beebe in 1852. You can access the debate online and my local library even has a copy. (McNair is spelled McNeir, but since Beebe self-published the debate the accuracy in facts, transcription, and spelling are all suspect!) Surprisingly, the debate made some interesting reading because Beebe arguments against legislation certainly came true when Prohibition was passed in 1929. Also, you can see the same liberal vs. conservative philosophies regarding constitutional interpretation being played out now 160 years later. Further proving that the more things change, the more things stay the same! I was also able to get valuable insight into how Rev. McNair was perceived by his opponent and what his debate style was. So despite my initial feelings of boredom, I was able to find quite a bit of information about the temperance movement that needed to be included in Rev. McNair’s book. I encourage you to research if your ancestors might have had an interest in temperance or perhaps rioted about it like they did in Chicago in 1855? Archives – Organizational meeting minutes etc. Burns, Eric. The Spirits of America: A Social History of Alcohol. Philadelphia: Temple University Press, 2004. Cheever, Susan. Drinking in America: Our Secret History. New York: Twelve, 2015. McNeir, John and G. J. Beebe. Maine Liquor Law Debate at Clinton, New Jersey, Wednesday, October 9, 1852: between Rev. Mr. McNeir, Pastor of Presbyterian Church, Clinton, N.J., and G.J. Beebe, editor “Banner of Liberty,” Middletown, N.Y. Middletown: Printed at the Banner Office, 1853. Pegram, Thomas R. Battling Demon Rum: The struggle for a Dry America, 1800-1933. Chicago: Ivan R. Dee, 1998. Reynolds, David S. Waking Giant, America in the Age of Jackson. New York: Harper Collins Publishers, 2008. This entry was posted in Genealogy General, McNair Family and tagged G. J. Beebe, Maine Liquor Law Debate, Rev. John McNair, Temperance Movement. Bookmark the permalink. Nothing boring about that! Very cool to find a debate he participated in. Based on what I know about some of my staunch and proper ancestors, I suspect many were supporters even if not leaders of the temperance movement. And when one thinks about how damaging alcoholism can be to families and society as a whole, it is no wonder. Yes, the behavior of people who didn’t drink moderately or had a predisposition towards alcoholism had a devastating effect on lives of their families. You would find Susan Cheever’s book interesting, especially the chapter on Pres. John Adams family and how alcoholism was a problem for many generations.